Very interesting... did they say which four varieties they chose as the oldest? I have 'Leda' here that is pre 1827 (and I thought this was old) but I did a quick search of HMF and the earliest Damask listed was from 1551 and was 'Versicolor'. Then was 'Red Damask' in 1560. In 1612 came 'Kazanlik', followed by 'Quatre Saisons', in 1633. 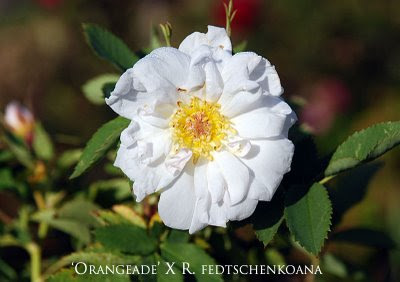 'Quatre Saisons' and 'Red Damask' are both listed as being from the follwoing cross: Seed: Rosa moschata Herrm. × Rosa gallica L.
Pollen: Rosa fedtschenkoana Regel (copied from HMF). The other two are listed as unknown. This one of yours may contain some of the things that make the Damasks excellent garden plants with the added benefit if a lurking remontancy gene too. I don't recall which four Damasks they tested, but you can be pretty sure R. damascena bifera and 'Kazanlik' were two of 'em. It is possible that 'Duchess of Portland' was another one. I think the paper does list the cultivars they used, but I don't have a copy of the full document. Paul, if R. Fedschenkoana the species is successfully crossed with tetraploid miniatures, I wonder if the F1 could be easier to work with (maybe smaller shrubs and maybe less invasive)? George, that is a perfectly reasonable idea, but there is never any guarantee that the offspring will experience any size reduction. I remember one of my first crosses 13 years ago mating 'Tuscany Superb' with 'Black Jade', and most all of the seedlings exceeded the size of BOTH parents by at least 2X! The best plant I still have from this lot is 10 feet tall and at least 12 feet wide. And yet, in a cross putting 'Muriel' on 'Twilight Skies', I got mostly very dwarf shrubs and small, restrained cascading style shrubs. I think your idea is well worth doing. I am simply working with a fertile hybrid that was given to me, thus saving me time and energy. Once you have a fertile seedling, you can worry about managing shrub size in the subsequent generations. Getting a fertile (species) hybrid in the first generation can be a much bigger obstacle.